Spring is in the air and summer’s fast approaching. Unfortunately, for a growing number of Brits, this annual change in season spells months of misery. Indeed, experts in immunology and allergies now estimate that hay fever effects more than one in every four people in the UK – a massive increase from the one in eight sufferers of the 1980’s. Yet, whilst there’s currently no ‘conventional’ cure for this debilitating allergic condition, which can leave you feeling like you’re battling a persistent case of flu, there is increasing evidence that Mother Nature has supplied her very own solution – bee pollen. Protein – on average bee pollen consists of between 35 and 40 percent protein, approximately half of which is made from amino acids that can be used directly by our body. Just one small teaspoon contains over 1 gram of protein, which is essential for the healthy growth and repair of muscles, internal organs and skin, and a superb source of energy. Vitamins – bee pollen contains a large variety of vitamins, including vitamins A, B, C, D & E. It is particularly rich in vitamin E, which helps to maintain our cell structure by protecting cell membranes. It also helps to boost our immunity and promote healthy skin and vision. Minerals – bee pollen contains a wealth of minerals, such as selenium, magnesium, calcium, copper, iron, silica, phosphorous, sulphur, chlorine and manganese. Lecithin – bee pollen also contains this special type of fat that’s an essential component of our body’s cells. Many apply lecithin directly to their skin as a nourishing moisturiser and it’s sometimes used to treat skin diseases, such as eczema, in addition to depression, dementia and Alzheimer’s. Natural fruit sugars – bee pollen contains more than 2 grams of carbs (in the form of natural fruit sugars) per every teaspoon – carbs are our body’s main source of energy. The B complex vitamins in bee pollen additionally help to transform those carbs directly into energy, making it an extremely popular food superfood for athletes. 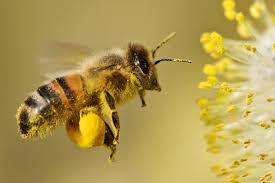 In fact, bee pollen has been harnessed as a holistic natural remedy and potent energy booster for hundreds of years. Famous Dutch footballer, Johan Cruyff, even attributed his unparalleled success on the soccer pitch to a daily serving of this so-called ‘Ambrosia’ (‘Food of god’) of Greek mythology. More recently though, bee pollen has been linked to an apparent natural ability to relieve and cure the symptoms of hay fever. But can we really ditch our anti-histamines and bumper boxes of tissues in favour of a regular quantity of bee pollen instead? Let’s find out! Can bee pollen really combat hay fever? There’s currently no mainstream cure for hay fever – anti-histamines and steroids are typically used to suppress and manage symptoms and patients are often advised to limit their time spent outdoors. Bee pollen on the other hand appears to tackle the root cause of hay fever by working on the principle of ‘desensitisation’ – the administration of gradually increasing doses of allergen extracts over a period of time that’s also known as immunotherapy. The pollen that honeybees collect is a heavy-grained variety, which as we now know, also contains bee saliva and other natural secretions. This affords it powerful anti-inflammatory, anti-fungal and anti-bacterial properties and enables it to demonstrably reduce histamine production. Indeed, studies have shown that as an antibacterial and healing agent, bee pollen is better than over-the-counter remedies for coughs, colds and sore throats and has additionally proved effective in the treatment of a wide range of other respiratory diseases, such as asthma and chronic sinus infections. It’s never too early to start building up your immunity to pollen in order to prevent an unwelcome bout of hay fever this summer. Try stirring a small amount of bee pollen into your daily smoothie, shake or juice or sprinkle it over breakfast granolas, fruit salads and desserts. Alternatively simply pop a teaspoonful of the yummy bee product directly into your mouth and allow to slowly dissolve. Start with just half a teaspoon and gradually increase to a maximum of 1 tablespoon per day. Always choose for a premium quality bee pollen from a reputable health store as these exclusively stock bee pollen that has been harvested by ethical beekeepers, who take great care to leave plenty for the bees themselves. Bee pollen can trigger an allergic reaction, such as shortness of breath, hives, swelling, and anaphylaxis. It is not safe for women who are pregnant or breastfeeding to consume bee pollen. Always consult your GP prior to purchasing bee pollen if you are in any doubt. The post Bee pollen – Mother Nature’s answer to hay fever? appeared first on Superfood blog - Healthy, Rawfood Lifestyle.